I'll begin this review with a confession: I didn't care much for 1995's original Jumanji. Despite the presence of the talented Robin Williams, I thought the film - with all its rampaging rhinos, deadly spiders, and knife-throwing monkeys - was far too scary and violent for its PG (that's right, not even a PG-13!) rating and wasn't all that appealing. However, when the trailers for this 2017 update of Jumanji came out (officially titled Jumanji: Welcome to the Jungle, and appropriately rated PG-13 this time around although less scary), I thought the creators had come up with a creative update to the original and was looking forward to seeing if they had pulled it off. The good news is that this new Jumanji is one of the rare reboots/sequels that surpasses the original. It's nothing deep or groundbreaking, but it knows what it wants to be and has a blast doing it. The film - directed by Jake Kasdan (yes, he's the son of acclaimed director and screenwriter Lawrence) - begins with a prologue that takes place in 1996, a year after the events of the first film. Teenager Alex (Nick Jonas) has come across the original Jumanji game - but even in the mid-90s, kids aren't interested in board games anymore, so he just throws it up on the shelf in his bedroom. Overnight, however, the board game has transformed itself into a video cartridge - and when Alex puts it into his game system, strange things begin to happen. The movie then jumps forward in time 20 years and we're introduced to the main characters of our story. There's nerd Spencer (Alex Wolff), his friend "Fridge" (Ser'Darius Blain), the self-absorbed Bethany (Madison Iseman), and the shy and insecure Martha (Morgan Turner), who all attend the same high school. Without giving too much of the plot away, all four of these students wind up in detention for one reason or another and stumble across the Jumanji videogame system. Spencer hooks it up and the four choose players from a menu list to play. Not long afterwards, they find themselves being sucked into the game and transported to a jungle environment. This won't be spoiler territory for anyone who has seen a trailer for the movie, but the four kids now inhabit the characters they have chosen: Spencer is Dr. Smolder Bravestone (Dwayne Johnson); "Fridge" is "Mouse" Finbar (Kevin Hart); Bethany becomes male Professor Shelly Oberon (Jack Black); and Martha turns into "man-killer" Ruby Roundhouse (Karen Gillan). Like actual videogame characters, each one of them comes with their skills and weaknesses (Finbar's weakness is particularly amusing and, sadly, ruined in all trailers for the film), and each also comes with three lives - meaning viewers of the movie will get to watch each character's demise at least once through the course of the film...only to have them come back into the game. The movie's storyline follows a typical videogame plot: Our heroes have to recover a missing jewel and return it to its proper place in the jungle, all while solving various puzzles or battling it out with numerous bad guys and/or jungle animals. What makes the story so entertaining is that each one of the actors is both self-aware and playing against type since they're essentially the teenagers we met at the beginning of our story trapped inside other bodies. So we have "The Rock" dazzled by his own muscular body and ability to "smolder" when addressing someone; Kevin Hart making disparaging comments about his own height; Jack Black playing a girl trapped in a man's body (and yes, they go "there" in case you're wondering); and Karen Gillan having to learn how to flirt with men because the teenage Martha using her body has never seen herself as attractive. If there's a character that doesn't work, its the fact that the screenplay has decided to throw in a villain (which would qualify as the "big boss" by videogame standards) in Van Pelt (Bobby Cannavale), who was also a villain in the original movie, although this version is quite different. Cannavale - who is a good actor - gets little more to do here than chew the scenery, but thankfully he isn't in the movie enough to ruin the fun that is being had elsewhere. With all the laughs going on, Jumanji still has some heart at its center - offering a strong message for kids and adults alike about being comfortable in one's own body. And when each of our characters come down to having only one life left to play with, there's a wonderful little speech by Kevin Hart's character about how one life is all we're given in this world and we have to make it the best life that we can. 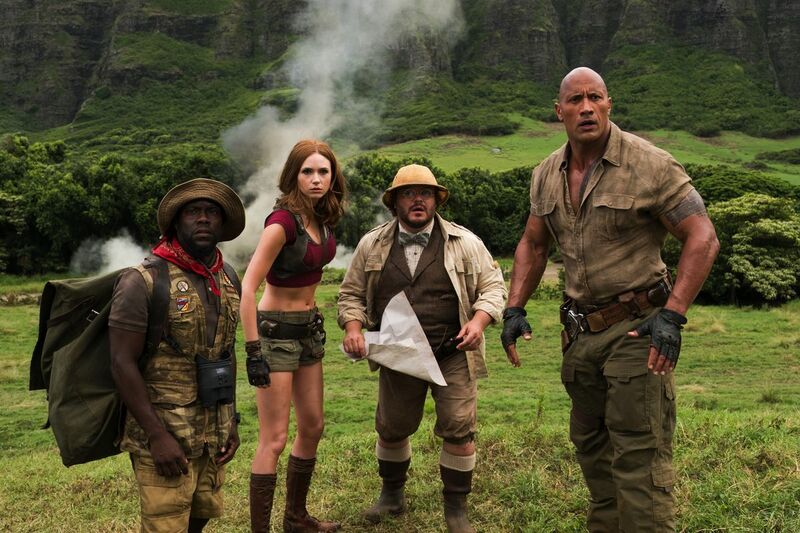 There's a few other surprises in the film as well - including an additional character our foursome runs into that probably isn't hard to figure out, but I'll stay mum on for those who want to keep some of Jumanji's fun for their big-screen experience. After so many attempts by Hollywood to make a successful "videogame" movie based on a popular existing licensed product, Jumanji manages to accomplish being the best videogame movie ever without actually being based on a videogame. It's a surprise gift at the tail-end of 2017 that turns out to be one of my favorite films of the whole year. Go see it - you'll have a blast. Order "Jumanji: Welcome to the Jungle" now!